Somewhere to park in Santiago? Santiago is a big city, and big cities can be a real problem if you are in a campervan. We have three guide books that cover Santiago and although between them they list hundreds of hotels, they don't list a single camp site! A search on the Internet found several camp sites "in Santiago" but on closer inspection they all turned out to be more than 50kms away. The other good source of places to park is the web-logs of other overlanders. Only two of the dozens we studied mentioned staying in Santiago . One of these said that they parked at Hostel Casa Kolping (S33° 25.515' W 070° 33.930') on Av. Isabel La Católica 5900, Las Condes . So we headed there. Unfortunately the hostel only had a very small parking area suitable for one or two Land-Rover sized vehicles. The second web-log said they had stayed in the car park of a "club". Following our GPS we drove from Hostel Casa Kolping to the "club". It did not look hopeful. The "club" was very upmarket, members-only (with a handprint scanner on the turnstile at the main entrance!) with wonderful sports facilities, swimming pools, restaurants, bars etc. There seemed little reason why they would want a scruffy overland vehicle in their car park. Still Judy asked at the gate, the guard sent her to reception, the receptionist sent for the manager, and for some reason he said: Yes! We could park in their car park, eat in their restaurant, drink in their bar and use all their facilities. He would even organise electricity and water for us! And all for $10USA per day. Thank you. The manager explained that the "club" did not really want to encourage campervans, but a few years ago several overland vans had stayed there under exceptional conditions. So I'm afraid I can't tell you where it is. But you could try here: Having spent a day looking round Santiago I have seen one possible parking area (with what looks like one local campervan parked in it). In the north-east of the city is a hill called San Cristobal (also known as Parque Metropolitano ). In this park there is a teleferico (a ski style bubble lift, not to be confused with the funicular railway also in the park). At the lower end of the teleferico on Av. El Cerro is a large car park that I think might be OK to park overnight in. Since the end of the magnificent Carretera Austral , the sights in Chile have, almost inevitably, become less impressive. There have been some good, some bad and some ugly. Below are some of the better ones between Puerto Montt and Santiago . 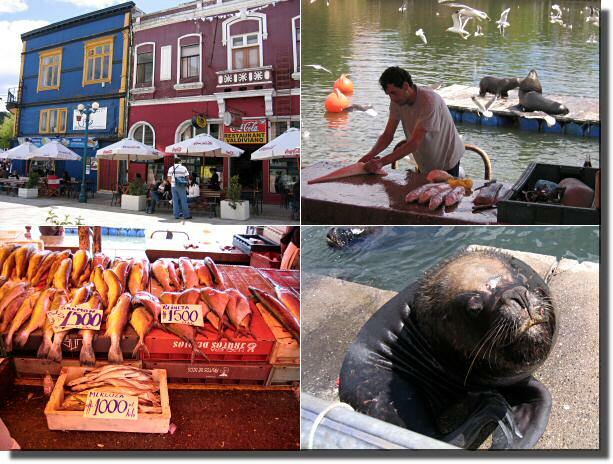 Valdivia: An "arty" little town with pavement cafes, a fine river and a great fish market (much appreciated by the sea-lions as well). We camped at Camping Isla Teja at S39.808580 W73.268168). 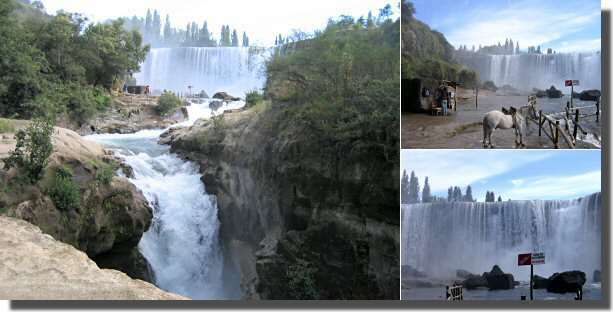 Salto El Laja: A short detour from Routa 5 about 25km north of Los Angeles . The falls are impressive from the bridge, but rather grubby close up. The fact that all the signs are sponsored by a well know soft drink company detracts from the natural grandeur of the place. There are lots of campsites nearby. The one we used, Manantiales , has absolutely nothing but proximity to recommend it. Chillán: Has two claims to fame. Firstly, the Chilean liberator (from the Spanish), the improbably named Bernado O'Higgins was born there. Secondly, the city has been destroyed by earthquakes several times and after the last time, in 1939, it got a new cathedral and a school donated by Mexico. 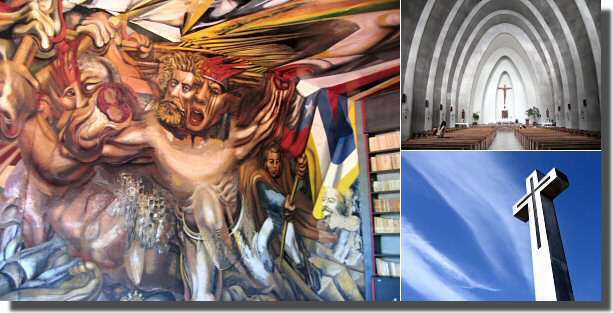 The Escuela Mexico has within its library two giant murals by David Alfaro Siqueiros and Xavier Guerrero. Like the book says, "visceral and powerful". We were unable to find anywhere official to park in Chillán , so we spent a quiet night parked on the street on the east side of the Plaza Heroes de Iquique (S36.601970 W72.105788) where we found free, un-encrypted WiFi (Feb 2007). Thanks. Stop Press: Mick, Mo and Mel are safely in Buenos Aires parked near the docks waiting for their ship to arrive, probably on the 2007-02-27.